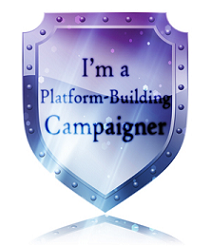 "Basically, the Campaign is a way to link those of us in the writing community together with the aim of helping to build our online platforms. The Campaigners are all bloggers in a similar position, who genuinely want to pay it forward, make connections and friends within the writing community, and help build each others' online platforms while at the same time building theirs." If you're an author/blogger, who wants to make some new like-minded friends, I highly recommend going over to her site and signing up. The deadline to register is February 15 and the Campaign runs through March 17. Do it! Fellow campaigner here. I love the booktrailer your kid made. It's amazing what kids these days can do, isn't it? I'm also a fellow campaigner. I'm enjoying visiting websites and looking at how people present work and connections. Hi Cat! I remember you from the last round. Thanks for stopping by and saying hello. And yes, it's truly amazing what kids can do these days. I (almost) feel like my parents back in the '80's who were baffled by the flashing time display on their vcr. Almost. Hi Stella! Thanks for visiting. Glad to meet you, too. Good luck Roger. I did the last one, but don't think I can do it this round. Maybe I'll see you more on the next one. Thanks, Stacy. Yeah, I hear you. There's only so much time when you're a writer and it must be spent wisely. Last time, I signed up for six or seven of the "sub-groups" and it took me a while to get around and visit everyone's blog. This time I'm limiting it to the Fantasy and MG/YA groups. That should be more manageable. Hi Bess and Misha! Thanks for stopping by. Roger, I am fellow campaigner stopping by to say hello and to hit your follower button. Loved the trailer your daughter made - what kids can do these days is amazing! Hello, thought I would visit your blog from the campaign. I've got to give you credit for the blog title. It caught my interest. Thanks for stopping by, Lady Gwen! I'll pass along your compliments to my daughter. Hi Andrew. Yes! Score one for my blog's title! Hi Tina! Thanks for stopping by for a visit! Your follower widget isn't currently working, but I'll check you out on twitter. Thanks, Christine. Yeah, sometimes Blogger is a little twitchy with their follower widget. I find I have to hit "reload" several times on some people's sites. Seems to be working now, though. Thanks for the twitter follow! Will reciprocate, of course. Yay for campaigning! I can't wait. Decided to check out your blog--fellow ABNA contestant. Plan to check out this platform, too. Chris K: Me neither! Woo hoo (as the kids say). Bobbie: Thanks for stopping by and best of luck to you on ABNA, too. Exciting, ain't it? Roger, just wanted to say hi. I'm in Group 2 of the campaign. I think it's cool that you had written for TV and that you do comedy. Hi Cynthia! Thanks for stopping by. And yes, it's a lot of fun to write for TV. Lately, I've been (mostly) writing TV animation which is extra fun. Hi Traci. I checked out your blog. Very nice! Darn. I should have signed up. Last time was such fun, and I met so many nice people, including you and Cat. I guess I let myself get distracted by working on the Magic Appreciation Tour. BTW, we have 9 authors and 11 books now! Daniel: Yeah, it's a fun and easy way to make new "book friends." Rachael deserves a hearty handshake (or at least a pat on the back) for coming up with this great idea. Sounds like your Magic Appreciation Tour is coming along nicely. That should be fun, too! Christopher -- Thanks for stopping by to say hello. Theresa -- I'll be stopping by shortly. Wandered over from the campaign. Been slowly making it though the MG/YA list. I'm having a writing exercise / contest on my site right now. Hi Rebekah and Danika! Thanks for stopping by.